Over four thousand Scientologists and their guests gathered to celebrate the opening of the new Church of Scientology of Pasadena. Joined by civic leaders and government officials, Mr. David Miscavige, Chairman of the Board of Religious Technology Center and ecclesiastical leader of the Scientology religion, presided at the dedication ceremony. A 25-piece marching band signaled the start of the July 18, 2010 dedication ceremonies of the new Church of Scientology of Pasadena at 35 Raymond Avenue in the city’s Old Town district. Upon the occasion, more than 4,200 Scientologists and guests filled the street to watch the ribbon fall on the fully renovated and restored historic Braley Building. Mr. David Miscavige, Chairman of the Board of Religious Technology Center and ecclesiastical leader of the Scientology religion, led the ribbon cutting for the new Church of Scientology of Pasadena, located in the city’s historic Old Town. After the ribbon fell, thousands of Scientologists and guests toured through the Church’s spectacular skylit four-story galleria, which rises through the center of the fully restored historic structure in the heart of the city’s Old Town. Following the dedication ceremony, thousands toured the Public Information Center of the new Church. Its multimedia displays present the beliefs and practices of the Scientology religion, the life and legacy of its Founder, L. Ron Hubbard, and the many social betterment and outreach programs of the Church. Scientologists and guests received tours of the Pasadena Church’s office for L. Ron Hubbard, Founder of Dianetics and Scientology. Every Church of Scientology around the world maintains an office for L. Ron Hubbard, as a sign of respect and in representation that the Church remains true to his teachings of the religion. At the heart of one of California’s most historically rich cities, is the new home of the Church of Scientology of Pasadena. Known as the Braley Building, this 58,000-square-foot structure is an official landmark in Pasadena’s celebrated Old Town, and will serve as the center for the Church’s social betterment and outreach programs for the entire San Gabriel Valley. 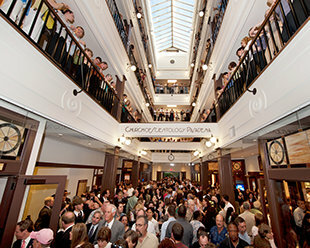 Preserved in a unique blend of the old and new, the reception of the new Church of Scientology of Pasadena welcomes parishioners and guests for introductory lectures, films, classes and self-guided tours of the extensive Public Information Center. Just one of the fully restored features of this historic landmark, the skylit galleria rises four stories in the center of the new Church of Scientology of Pasadena. The galleria, built and decorated in an Arts & Crafts motif, leads straight to the extensive Public Information Center and offices where the Church’s far-reaching humanitarian initiatives are coordinated. On either side of Reception is the Public Information Center. 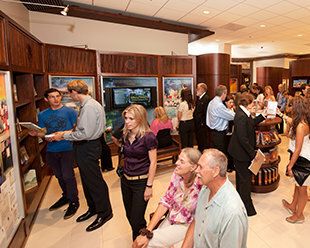 Guests are welcome to take self-guided tours of the extensive multimedia displays, which present and illustrate the beliefs and practices of the Scientology religion, the Church’s many social betterment and community outreach programs, and the life and legacy of Scientology Founder, L. Ron Hubbard. This Seminar Room provides the ideal setting for people from all walks of life and faiths to become acquainted with the fundamental truths of Dianetics and Scientology, through introductory lectures and services. Students pursue their studies of Dianetics and Scientology in the Church’s Academy, which covers an entire floor of the fully restored and renovated building. As both drug abuse and pollution are significant problems in Southern California, the Pasadena Church’s Purification Center serves parishioners with a precise and closely supervised religious regimen called the Purification Program, which addresses biochemical barriers to spiritual progress. With wall-to-wall stained glass panels inscribed with Scientology codes and creeds, the Chapel of the new Church is home to congregational events—from Weddings to Naming Ceremonies and Sunday Services. As is tradition in every Scientology organization, the Pasadena Church maintains an office for Founder L. Ron Hubbard. A tribute to Mr. Hubbard’s legacy, this office signifies the Church’s dedication to remain true to his teachings and the aims of Scientology. 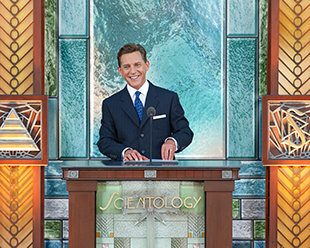 Mr. David Miscavige, ecclesiastical leader of the Scientology religion and Chairman of the Board of Religious Technology Center, presided at the ribbon cutting of the new Church of Scientology of Pasadena. Located in one of the busiest pedestrian districts in the Greater Los Angeles Area, this turn-of-the-century monument has been preserved in a unique blend of old and new. Its heritage is reflected in the restored Beaux Arts exterior, its classic four-story skylit galleria, as well as its furnishings and stained-glass windows in the Arts & Crafts style. While with attention to 21st century energy-conscious planning and construction, the new Church meets LEED (Leadership in Energy and Environmental Design) requirements for environment-friendly building materials, energy equipment, lighting systems, reduced water consumption and more. Also commemorating the occasion were local officials and dignitaries from this historic city. After the ribbon fell, thousands of Scientologists and guests toured through the Church’s spectacular skylit four-story galleria. Following the dedication ceremony, thousands toured the Public Information Center of the new Church of Scientology of Pasadena. Beyond its services for parishioners, the new Church features an extensive first-floor Public Information Center, just off the galleria. Its multimedia displays present and illustrate Scientology’s beliefs, the life of its Founder, L. Ron Hubbard, and the full array of the Church’s social betterment and community outreach programs. The Church of Scientology of Pasadena is the sixth new Scientology Church (and the second in Los Angeles County) to open in 2010. Another six new Churches of Scientology are scheduled for completion before the end of this year.